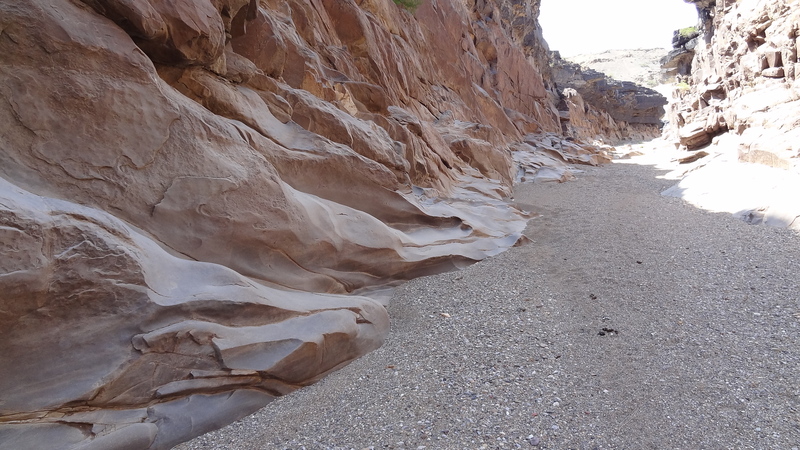 The distinctive sedimentary formations along Estufa Canyon intrigued me. As I marched down the wash, admiring them with their cylindrical shapes and correponding cylindrically-shaped voided spaces, I considered why "estufa" or "stove"? 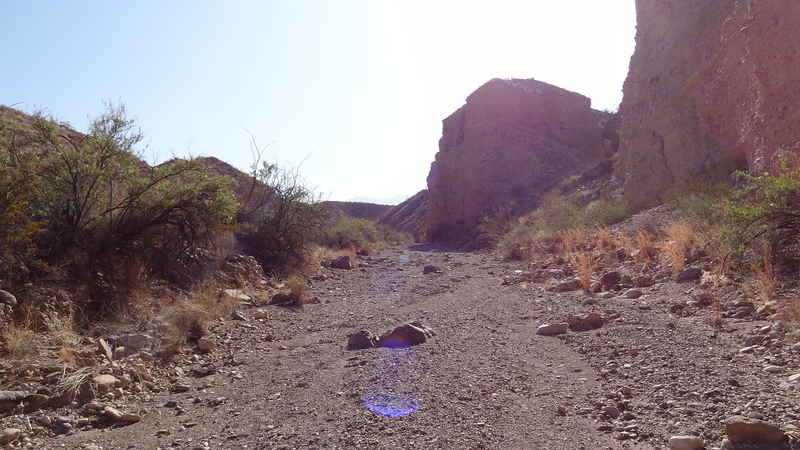 Surely it was hot in the sun, but what wash in Big Bend isn't? 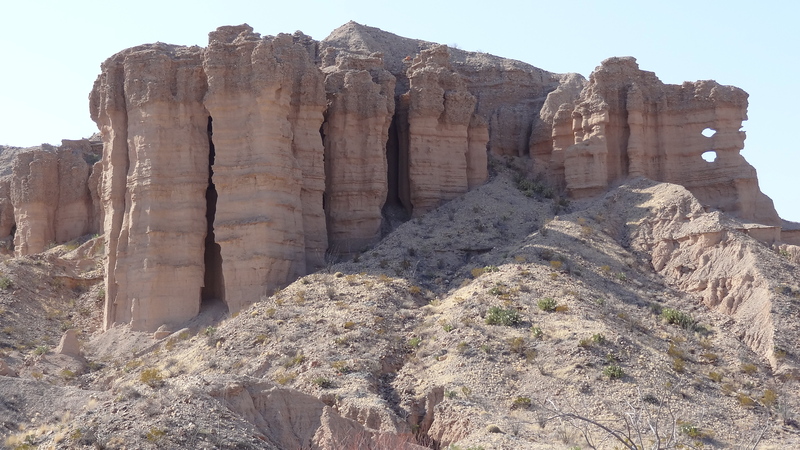 The formations began to look to me like vertical pipes, more like stovepipes (or conductos de estufa). 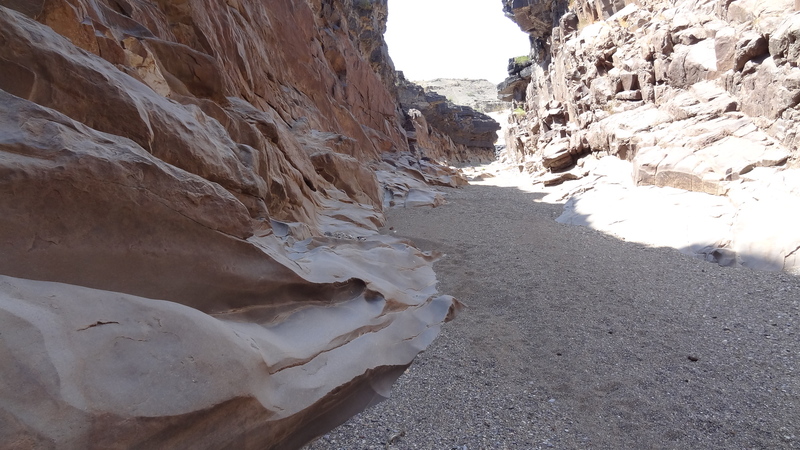 So perhaps, I thought to myself, the canyon reminded folks of stovepipes? 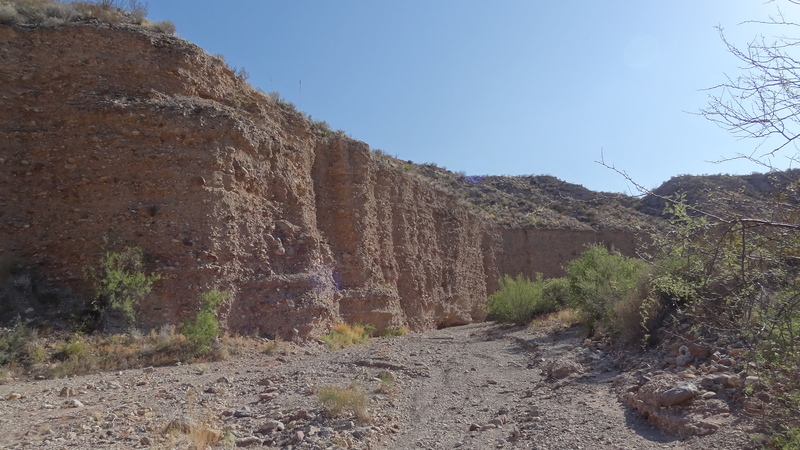 By the way, an old map I saw labeled this canyon as Rice Canyon. 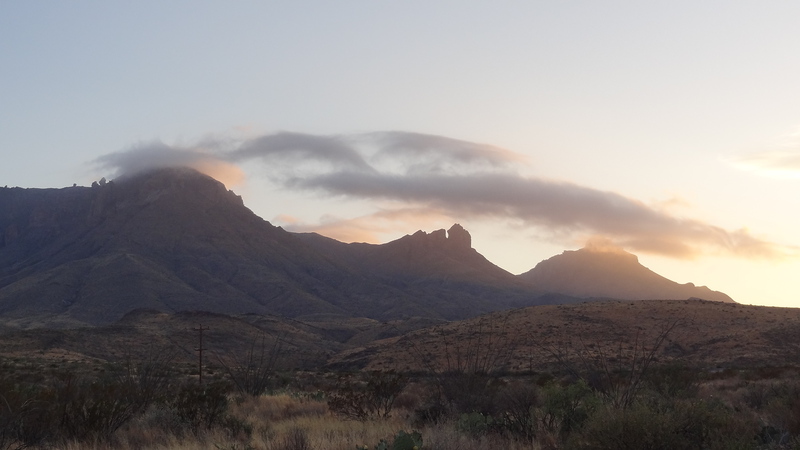 Like a lot of things in Big Bend, I guess it has both an Anglo and a Hispanic name. Estufa Canyon pruportedly was named because someone once found a stove (as in kitchen cookstove, not a campstove) there. It is an area that has some sort of meteorological "heat-warp" it is indeed seemingly hot as hell all the time! Neat place though. 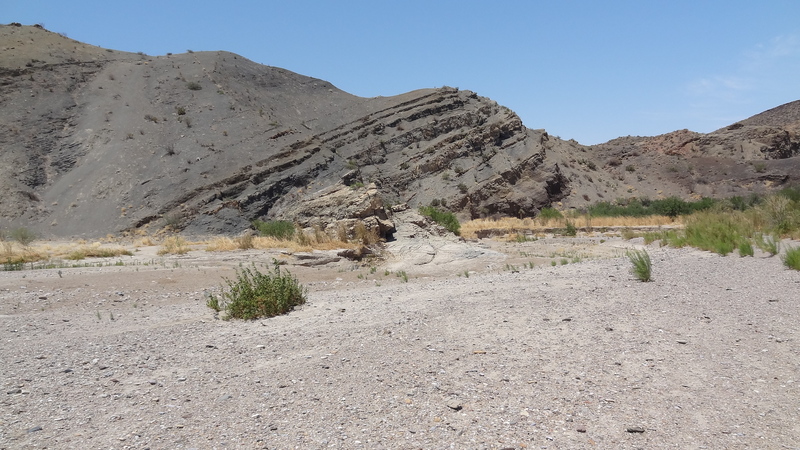 I usually come down Tornillo Creek to Banta and then out via Estufa. No particular reason, that is just what I have done in every visit but one. 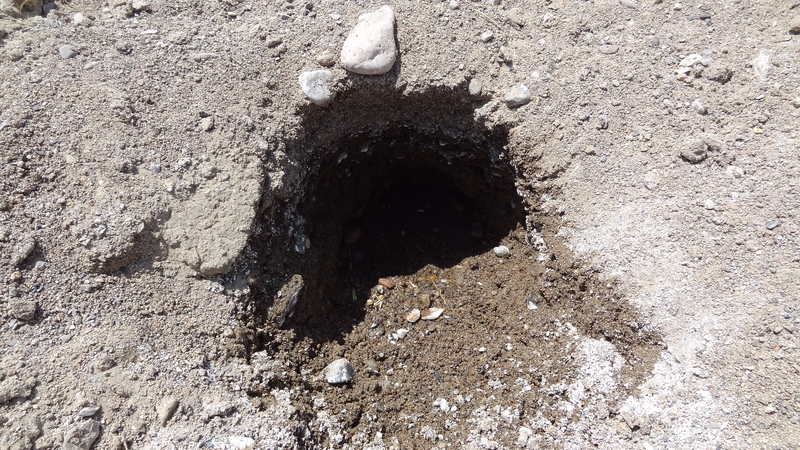 At first I thought these were badger holes. 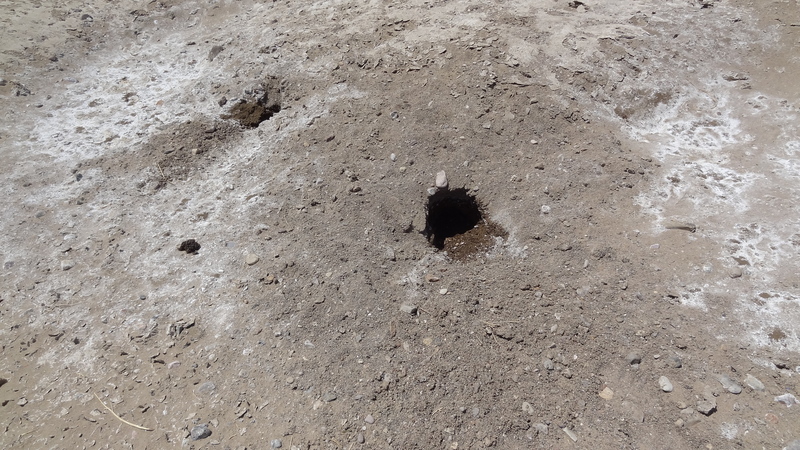 Then I realized the creatures were digging for water. and there in the creek bottom. Then I spotted one overhead in the bank. Looking up ahead there are more embedded in the bank and then transitioning into the creek bed due to dipping of the sediment layers. Reaching the dry pool I mentioned in my earlier water report. 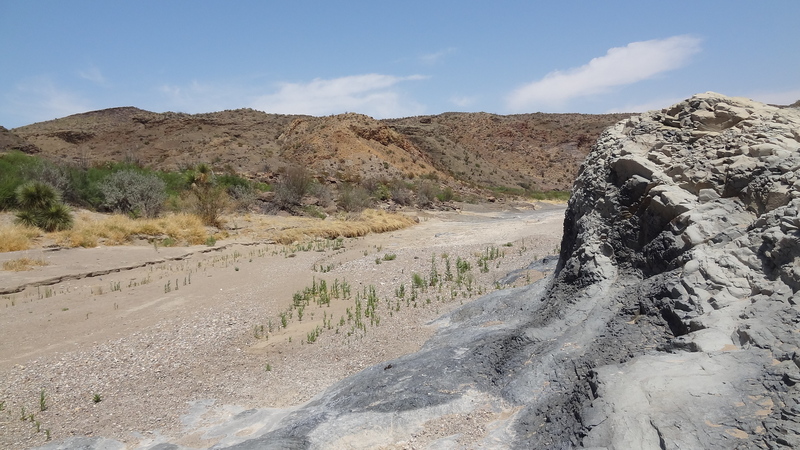 Yes, that is an interesting post as well as his other one on Estufa Canyon. Thanks. 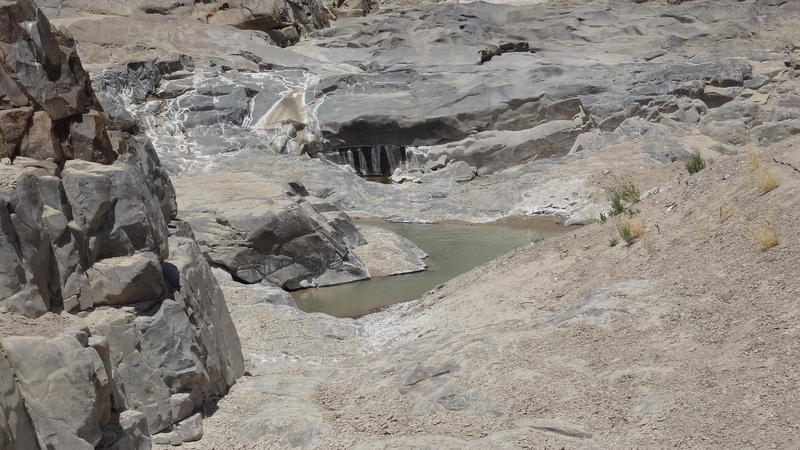 Water leaking from the middle pool to the lower pool through a fracture in the rock. 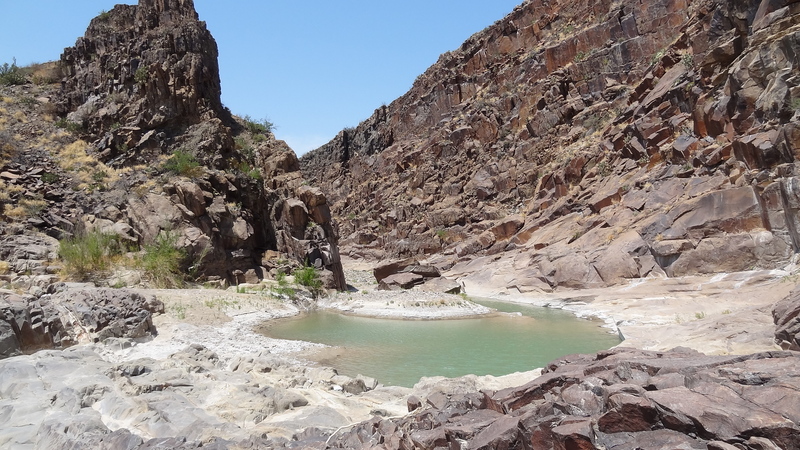 Middle pool where the canyon makes a sharp turn to the left. 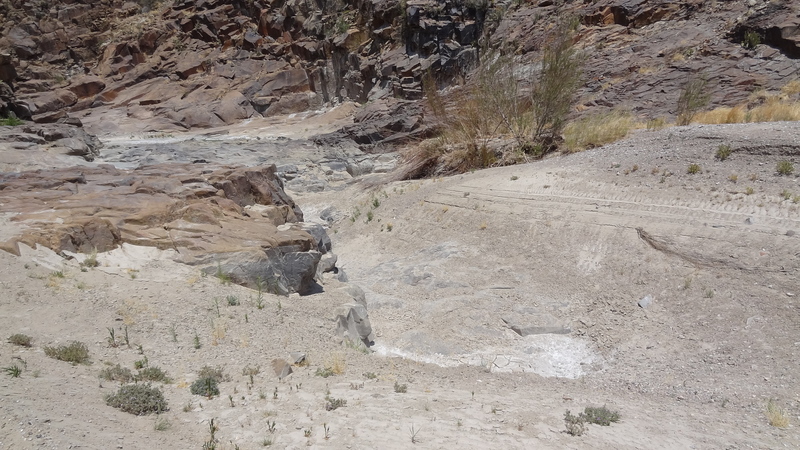 Lots of mule deer tracks and mineral deposits near the upper pool. 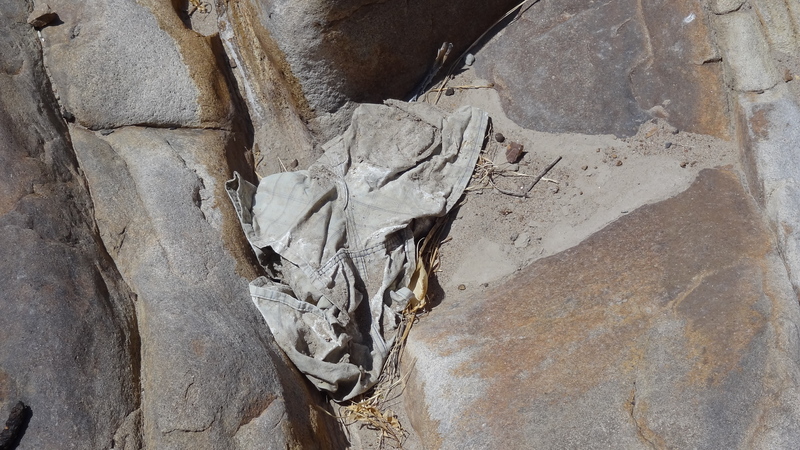 Are these the shorts DSR fished out of the water? 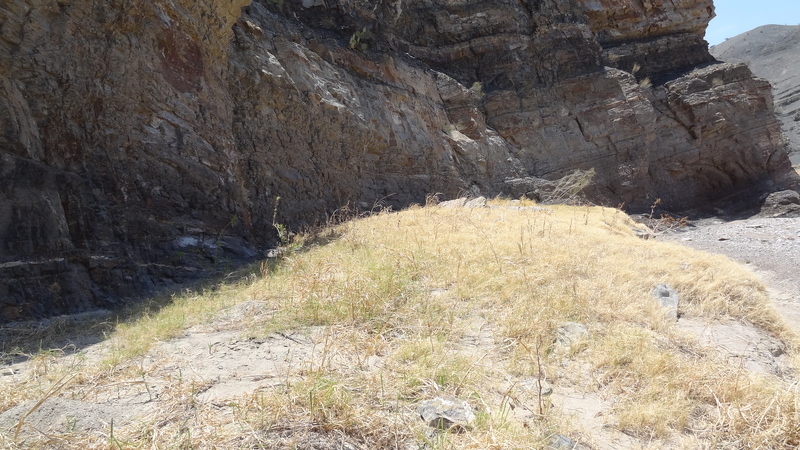 Narrow part of the Shutin above the upper pool and before the black rock section. 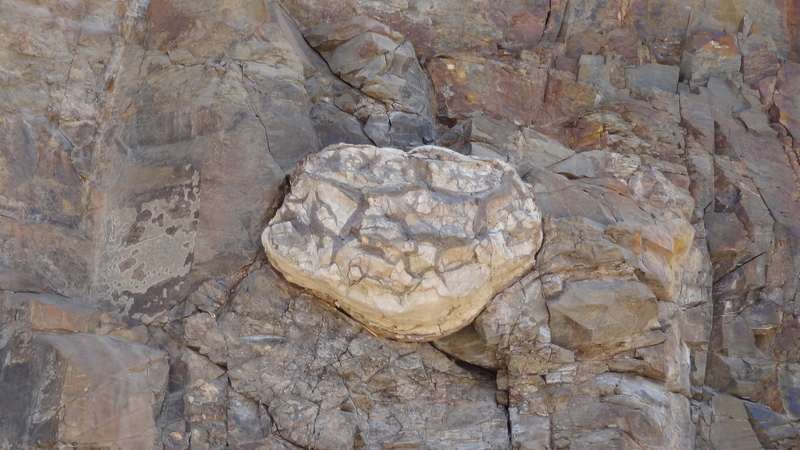 Look at how beautifully the rock has been smoothed and shaped. In the narrow section looking back at the upper pool. Dig those amazing shapes carved into the rock. Black rock like you have never seen before. 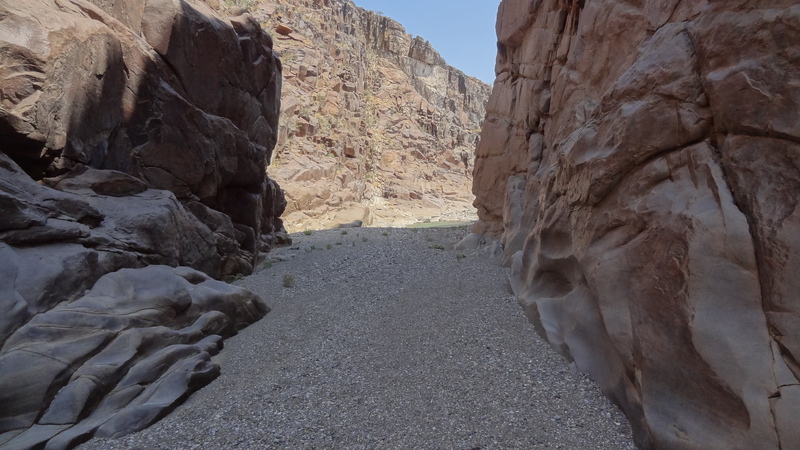 Emerging from the black rock, the canyon starts to open up again before a long sweeping turn to the right. Looking to the right of the previous shot, there was a dead end nook back within the black rock. Coming back from the long sweeping turn and heading back toward the Shutin. 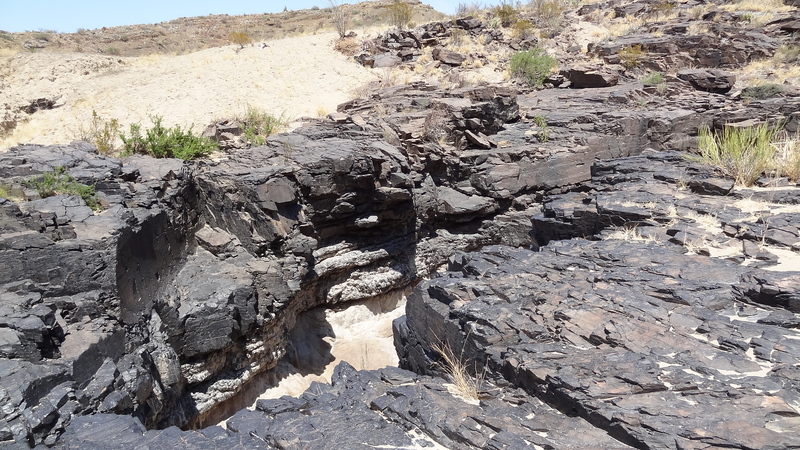 Instead of entering the Shutin, I first walked up the ramp formed by the tilted black rock layers on the west side. Looking down into the Shutin from on top of the black rock. 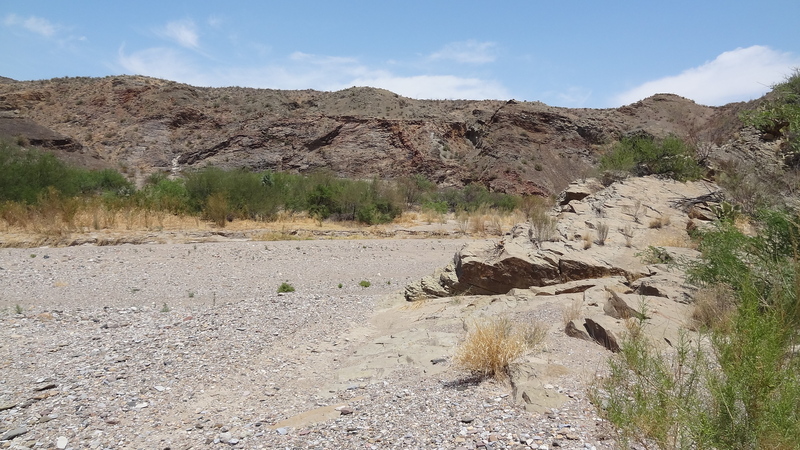 From Tornillo Creek, the Estufa Canyon "delta" is very wide open and braided. 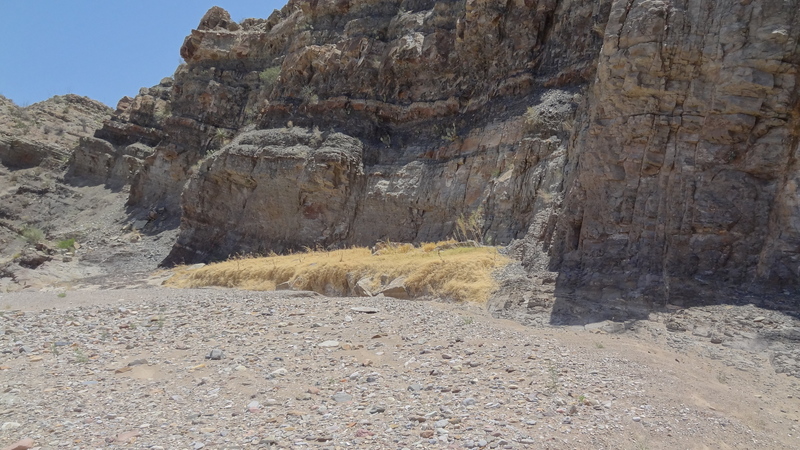 Here I am beginning to enter the canyon walls and spot two holes on the distant formation. 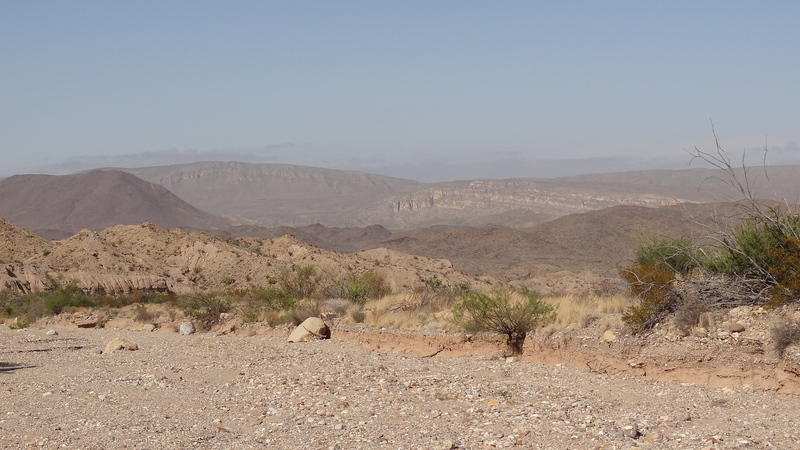 Looking back toward Tornillo and the hills beyond. 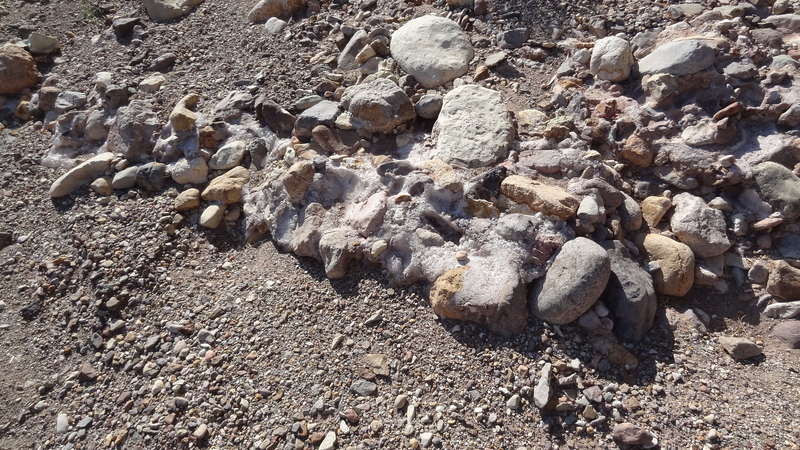 Cobble-sized aggregate that appeared heavily cemented with quartz. Back in the canyon proper. There was an alternate channel off to the left, but I was hugging the shadier side as much as possible. Looking back from the same spot. 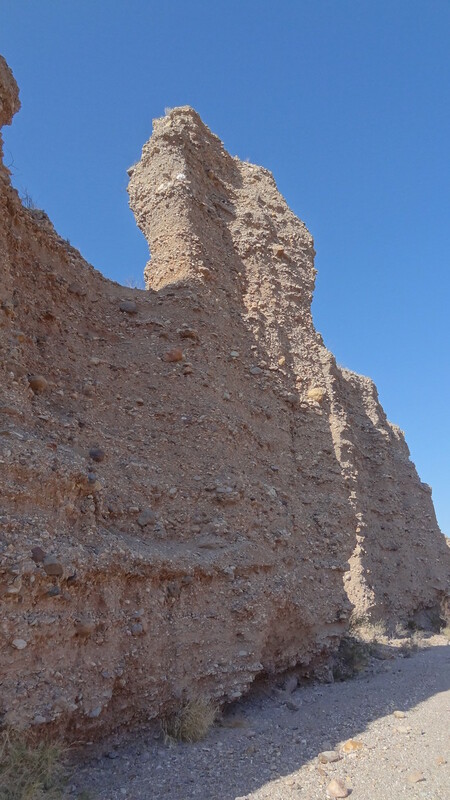 Shadows were starting to get longer as I reached this tall cylindrical hoodoo. However, it looked entirely different from the other side. Nice shade found near these steep gravel walls. 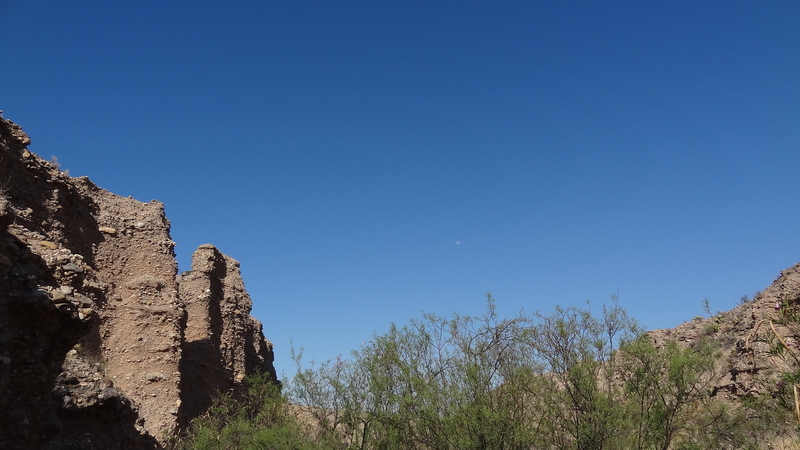 Shadows on the canyon walls and the moon appearing in the evening sky. Start of a sharp bend to the right up ahead. In some places, I could take the cutoff channel instead of following the main channel. 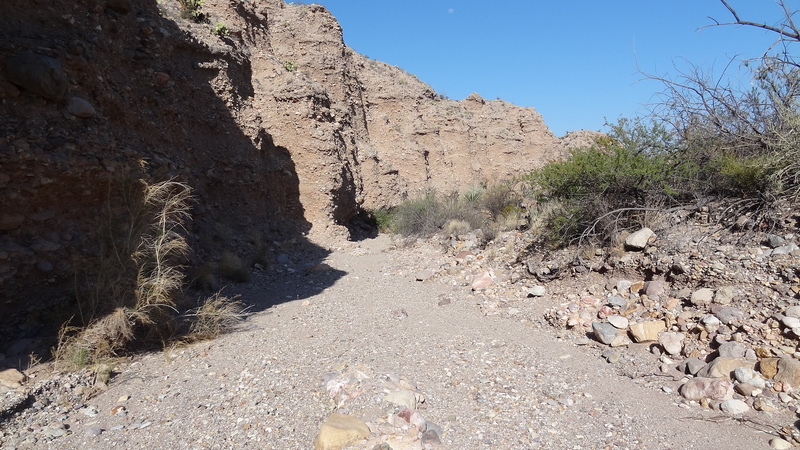 Up on the alluvial terrace above Estufa Canyon on the last leg to K-Bar #2. Funny little clouds stuck on the mountian tops to the west of K-Bar. Well water storage prior to being boosted up to PJ. It had been a great day of hiking and I arrived back at the truck just in time to drive back to camp as the sun slowly sank behind the hills. Wow, it has been a busy late spring and early summer with all goings on of my wife and our fast growing up kids. Let's see if Flash can wrap this one up! After hiking 17-1/2 miles on Wednesday, I was ready to go slow and easy the next morning. 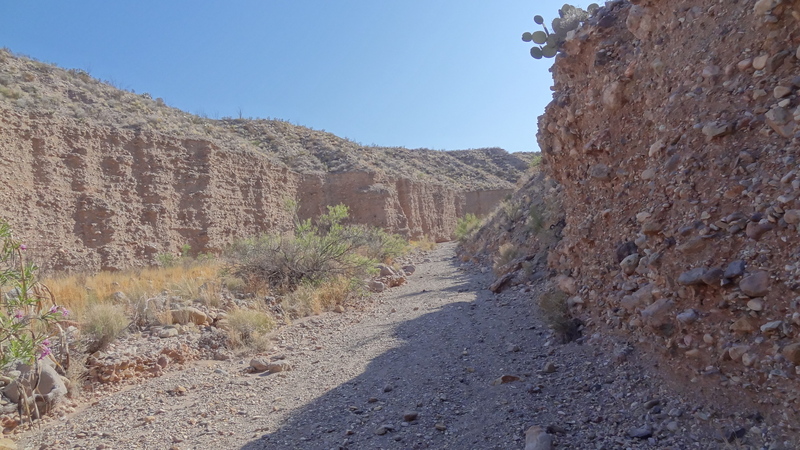 I left camp and headed down the Basin Road intending to resume exploring several points of interest to me in the Sam Nail Ranch area. However, one impression had stuck in my mind from the Monday hike along the old Oak Canyon Road while checking out Homer's fenceline. According to my map, that old road went all the way to Route 13, the current main Park Road. 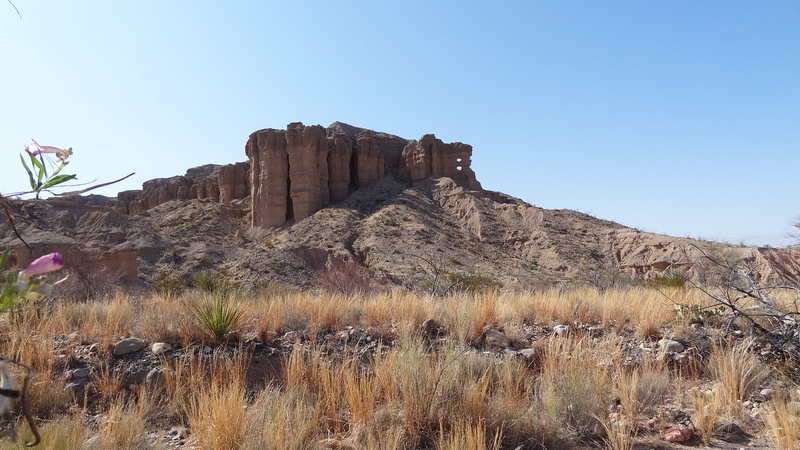 Needless to say, as I reached the part of Route 13 where it curves widely around the Sphinx, I ended up stopping at a pullout not 0.2 miles from the intersection with the old road, which appeared to be barricaded up the hill, by a large block of stone. 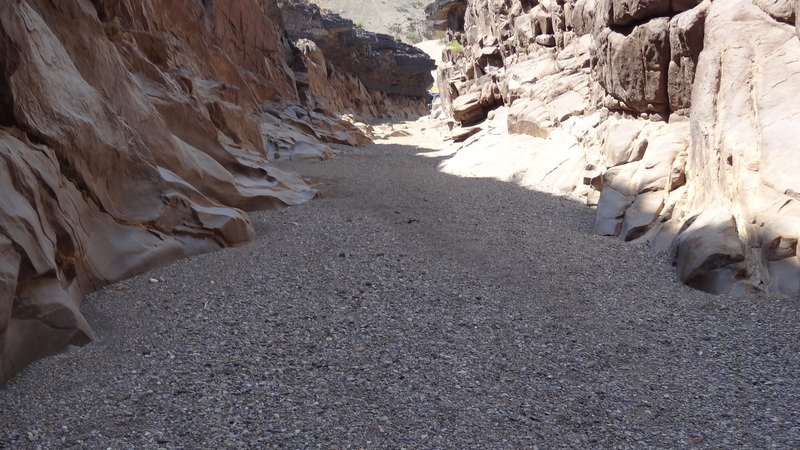 Since I was a bit sore from yestarday's walk, I thought walking an old road sounded like a great idea. Here is a map showing the old road that runs from southeast of the Sphinx to a point west of the Tiedown Tree. First thing I noticed after walking about 1/10 mile to the top of the hill was that the old road didn't look half bad. Seen far worse in the Park. Better than Old Ore I'd say. Looking back, there is the Sphinx, although my daughter once thought it looked more like Hippo Rock. The proverbial 12 oz. steel drink can, which reminds me of drinking Canada Dry or Shasta sodas on family camping trips. Might be nothing, but old, old fire ring? Leaving that flat open area, here I am moving along up the road toward Oak Canyon. Along in here I spotted some mule deer that I no doubt spooked away. Looking back again toward the Sphinx and Slickrock Mountain. 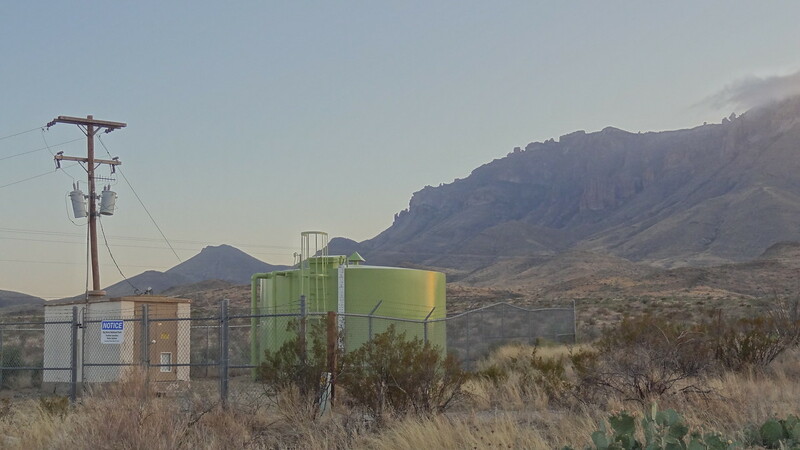 Eastward are the northern Chisos foothils with Pulliam Bluff in the background. About 12:35pm, I stopped to shoot some photos of my surroundings and decided I had reached my turnaround point. Here is Vernon Bailey. Then the Window from an unusual angle and Amon Carter. The road ahead and Ward Mountain. The way back after turning around. 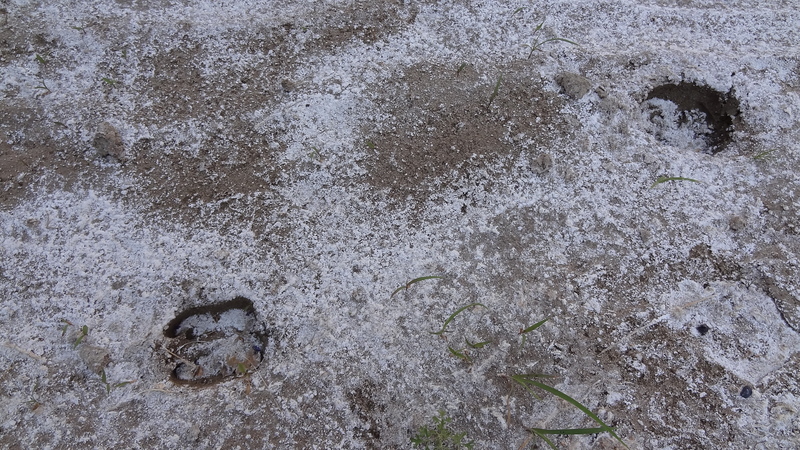 As I approached that same flat open area where I earlier discovered the old soda can, I spotted these white stones that seemed out of place. Flint from Apache Canyon you think? 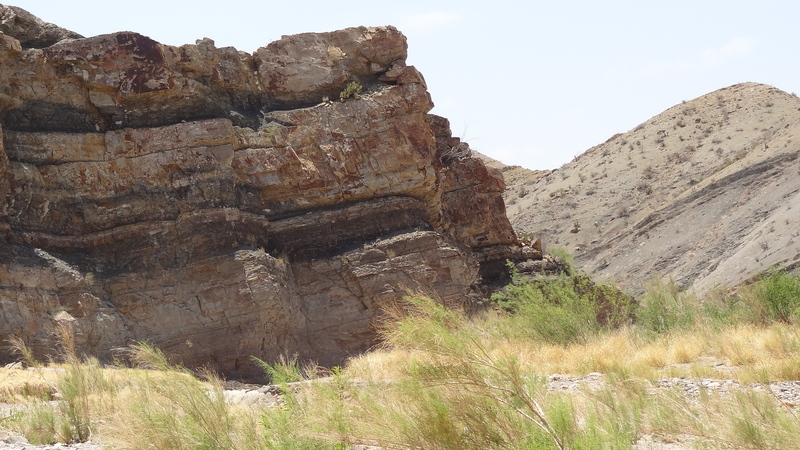 Scanning the surrounding area, I spot a second stake with two rocks, one with faded yellow paint. The two stakes are about 25' apart. I'm thinking horseshoes, but then my mind shifts to washers or some tossing game like washers. What a find! Who played washers here? Cowboys, herders, Boy Scouts, or the local spit and whittle bunch? Next I started walking the imaginary line formed by the two stakes and, sure enough, found another stake! Followed by a fourth one. That makes two washers courts! Each stake had one or two rocks to serve as a backstop. Oh, but there is a deer antler. At this point, I was starting to believe that, with three tossing game courts literally in a row, this area might have been used for group camping at some point in the past, perhaps if not pre-Park, then in the early Park days. Here, the light was such that I was able to spot the hint of old tire tracks. I wandered around looking for more evidence of camping, etc. 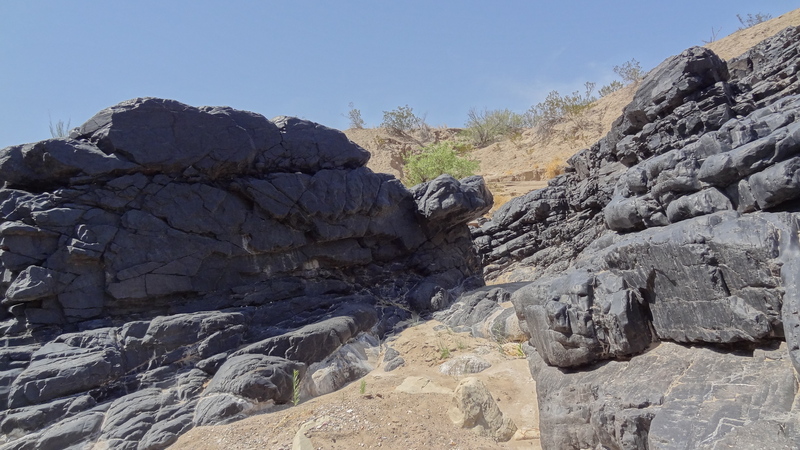 At the far end of the open area, this spot was curious to me because it seemed the creosote bushes here had caused the underlying rock to erupt through the surface sediments. Same wide open area but here, in this spot, these four rocks really stood out to me. After wandering about the "camp" area for quite a while, I ended up back at the first "goal" in the first "court" I had found. 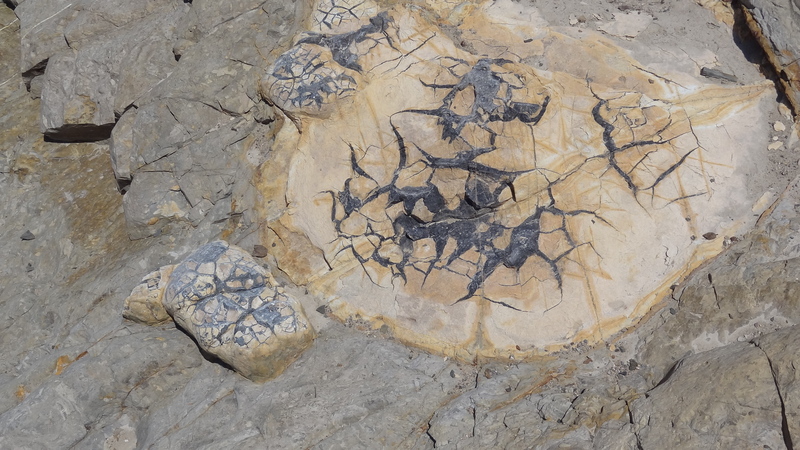 Something about that blackish rock with the faded yellow paint was screaming out at me. Picking it up and looking it over, I thought, where did I recently see rocks of this type and character? Banta Shutin of course. 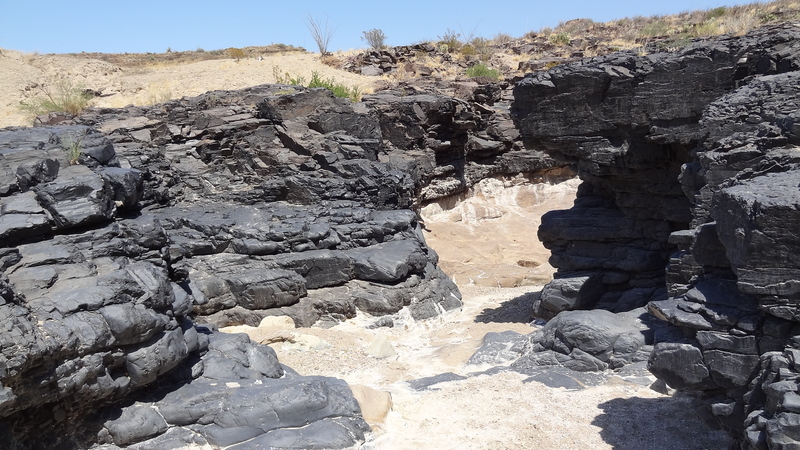 Similar to those cool black rocks north of Banta Shutin. 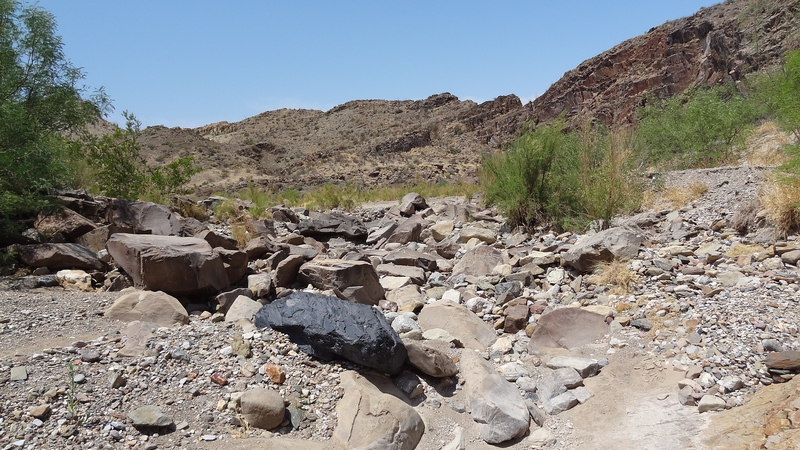 Are similar rocks found elsewhere in the Big Bend area? I'd like to imagine this might be one of the throwing stones for the tossing game. Stone at the bottom center, with that faint yellow tone, looks like it might also be a tossing stone. 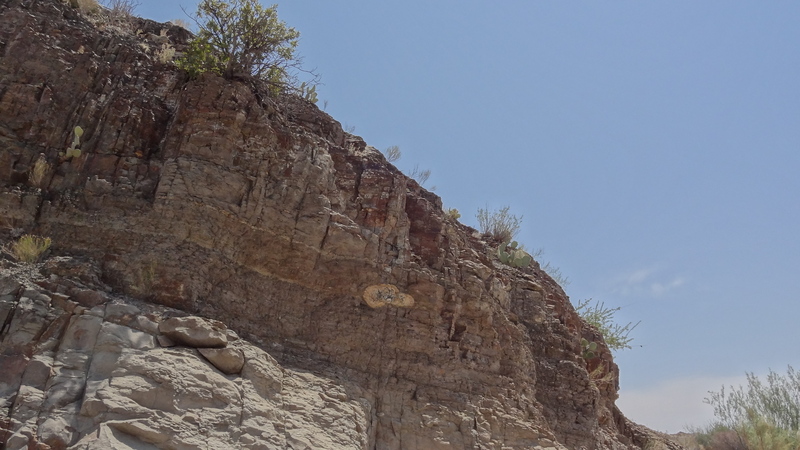 One of the "goals" from the third court, which seems to have remnants of faint yellow paint on the rock and on the stake. 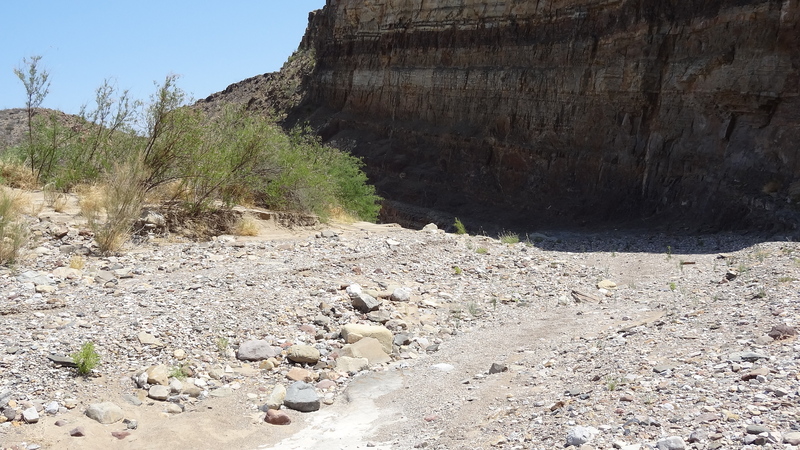 Here is a close up of my track log in the area of the flat open alluvial terrace "camp" area that I explored. 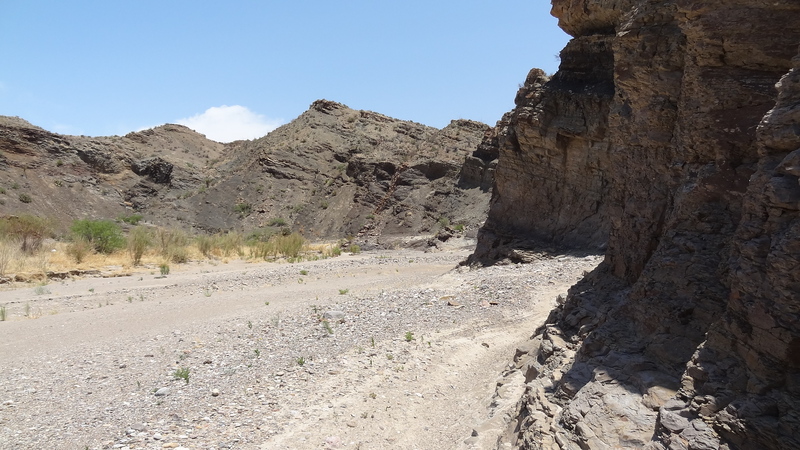 In old maps I have studied since, there appears to have been a road that approached from the south from the Gano Spring area that tied in right about there. 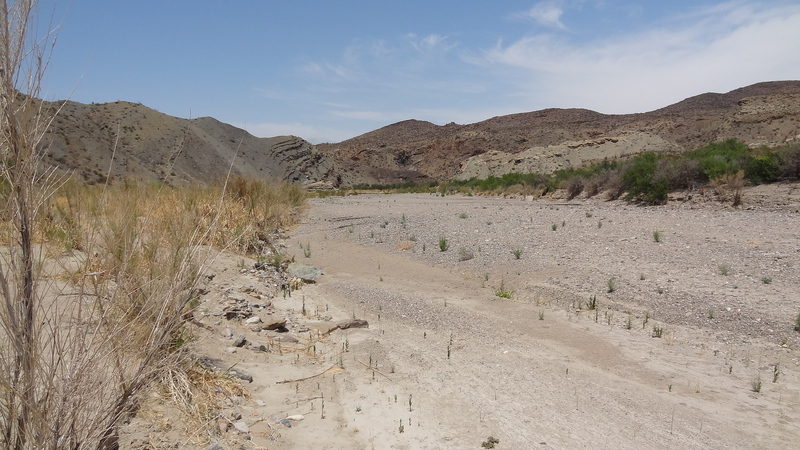 Reaching the end of the alluvial terrace on the edge of the "camp", I stopped to view the surrounding area before heading back to my truck in the distance by the side of the road. Said my good-bye to the Sphinx backed up by Slickrock and Croton Peak. Looking east toward Rough Mountain and the area I hiked on Tuesday. Returned to the truck about 2:15pm. Hiked 4.9 miles over a period of 2-3/4 hours. Drove on west to the Cottonwood Store in Study Butte for a few groceries. Got a shower at the motel. Wandered around the cemetery in the ghost town. Sat on the Porch for a bit. Ate an early dinner at La Kiva, but alas they had no Big Bend Brewing Company beer. By 7:30pm, I was back in Basin Campground rocking in my hammock before reading in my tent after turning in for the night. Dang Flash, another mystery ! I can't tell from your commentary if the "washer courts" are laid out side by side or end to end ? If end to end, in a line, could they be marking something - a future fence or something that either never got built or got torn down ? Do you ever make it to Sam Nail ? Flash: this is a great report on a great trip! Looking forward to the next installment. 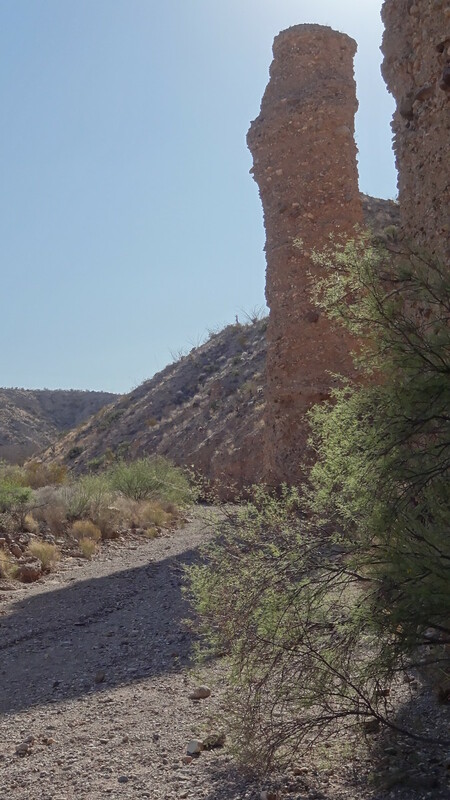 By any chance, did you find 'Hartung's Road' that Edward Abbey mentions in one of his short stories? Here, the light was such that I was able to spot the hint of old tire tracks. 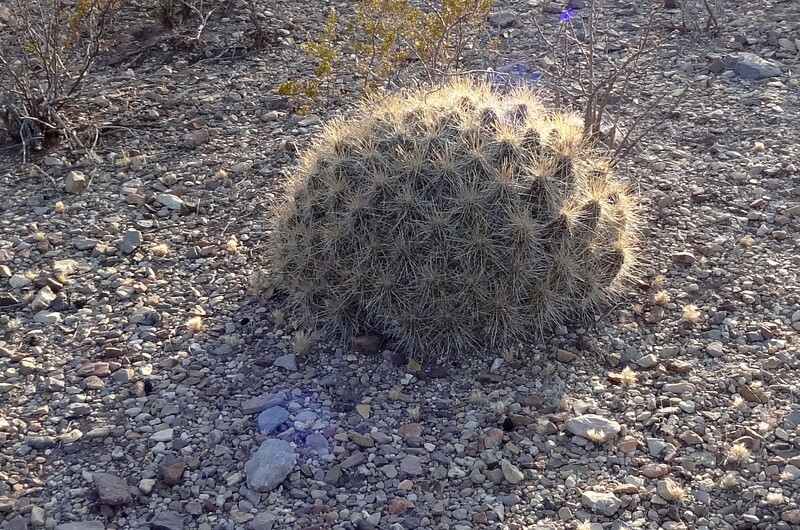 These are very good examples of what a lot of folks fail to see if they hike off trail. The road alignment and even the very faint tire tracks jump out to the trained eye. The untrained eye simply fails to recognize the alterations. 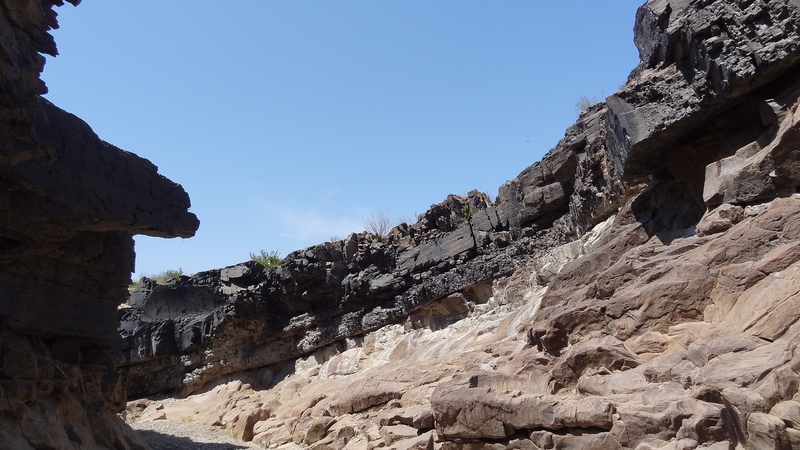 Not unlike folks that cannot see rock art until it is pointed out to them. The gps track shows the features are a linear alignment. Alan, I described how I searched in line with the first pair I found, so yes they are end to end. It was clear they are arranged in pairs: Rock, Stake, Stake, Rock, Rock, Stake, Stake, Rock, Rock, Stake, Stake, Rock. This can be seen in the photos if you enlarge them in your browser. The game was probably played similar to horseshoes or washers or some of these bean bag toss games. 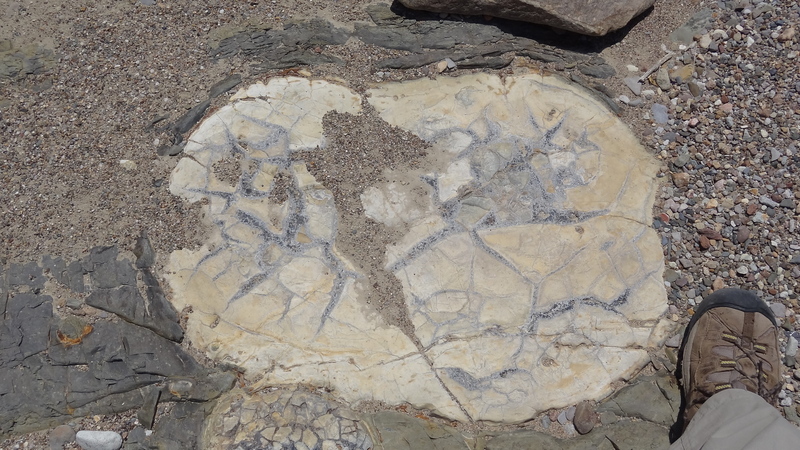 I am guessing, based on the evidence, that they used flat stones marked with paint. * Weird cool find indeed, but no stranger than a washers court sunk into a barn floor or a tailgate bean bag toss game. Sam Nail was being illusive after the brief visit on Monday. It will keep. 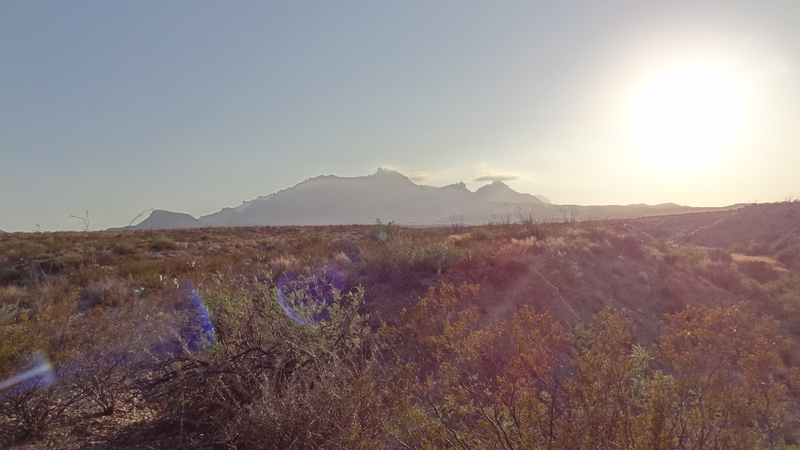 The north Chisos foothills held my attention this particular week. * This is, of course, imaginative speculation on my part. Thanks, Imre. Glad you are enjoying it. I know nothing of a Hartung's Road. Is it something mysterious? I searched Google and found this. I do suspect this road along with the one I followed while going to Rough Spring on Tuesday, were both maintained (as in bladed) in the pre-Park days. The game was probably played similar to horseshoes or washers or some of these bean bag toss games. 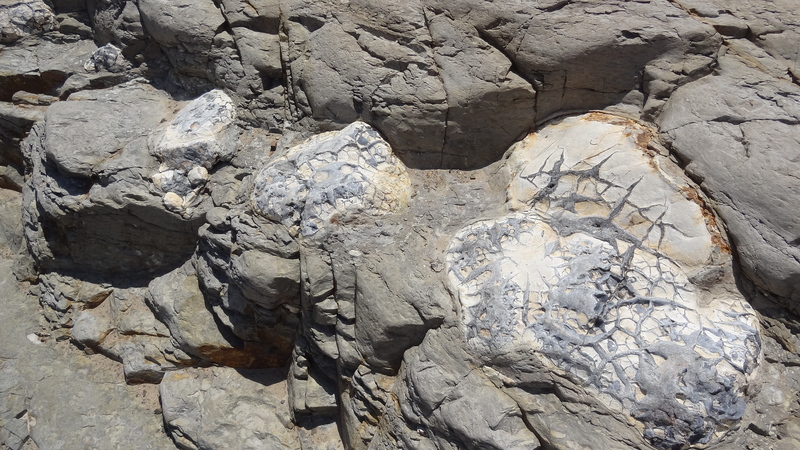 I am guessing, based on the evidence, that they used flat stones marked with paint. I am curious as to how you arrived at the conclusion the stakes and rocks are marking some kind of playing field? There is nothing to suggest that. 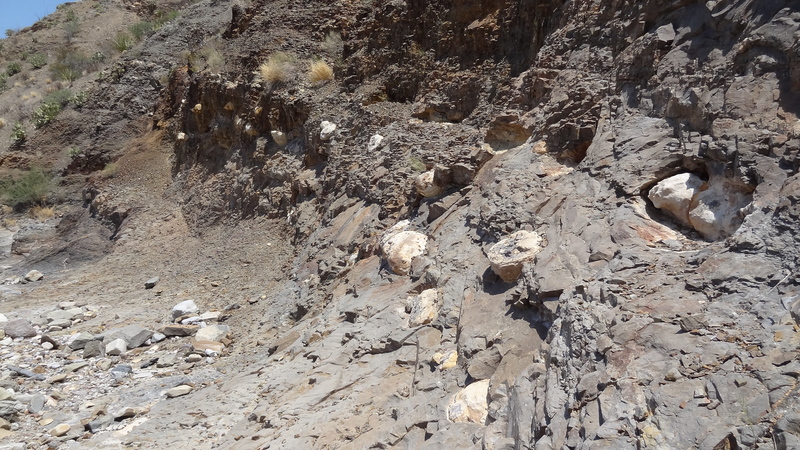 The small rocks referred to as tossing stones cannot be affirmatively associated with the stakes and larger rocks. 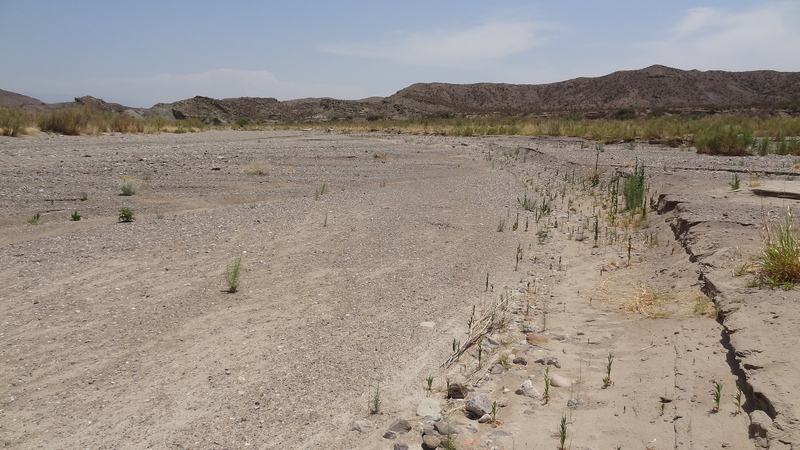 Your photos show no indication of any concentrated impacts which would occur from long-term or repeated occupation of an area as a campsite or work area, which further reduces the likelihood these stakes have some recreational implication. That a single vehicle pass left visible marks in the desert pavement shows the ease with which use impacts occur in the desert. 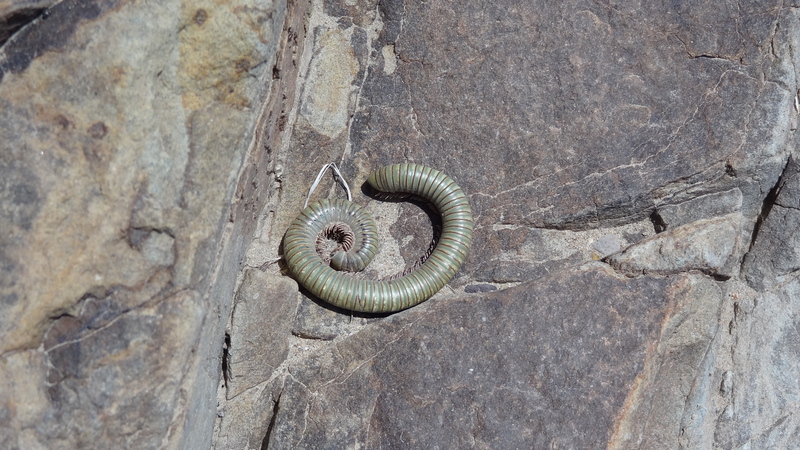 Consequently, it is much more likely the rebar was used to mark something of interest. The painted rocks would have been placed there, not as game backstops, but as an aid to relocating the rebar at a later time. 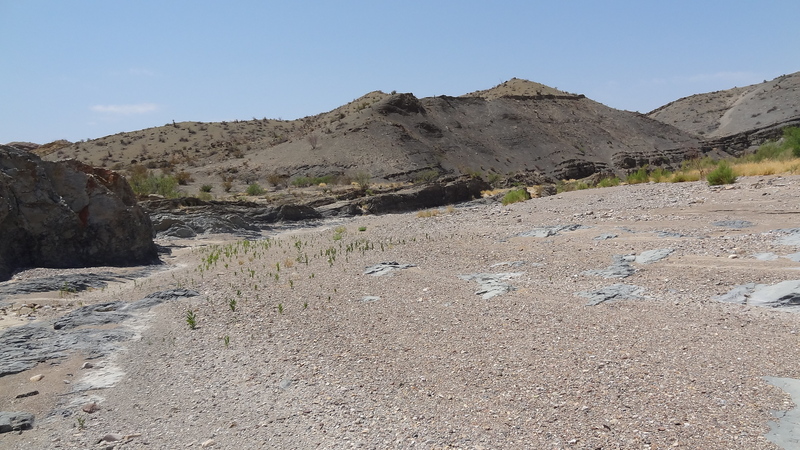 A short, thin, rusty rod in the desert is very hard to see; painted rocks not only would be colorful, but they also are much larger than other materials in the area so they also would aid in finding the stations. 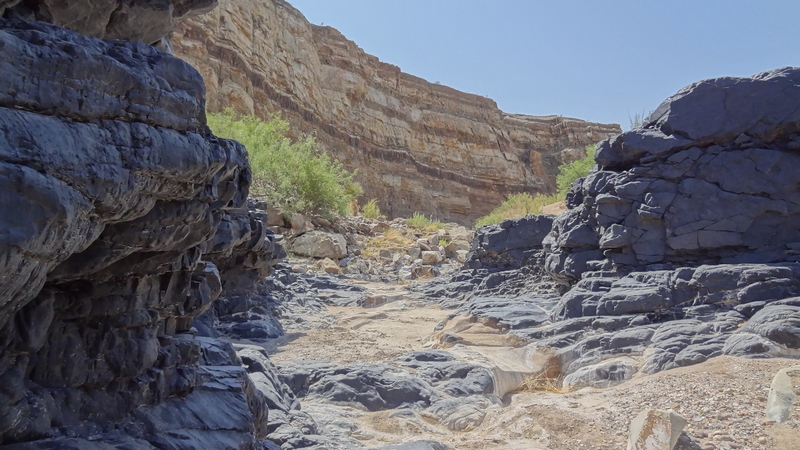 The utility of using such rocks is seen in your photo of the four rocks; they are hard to miss in a expanse of desert pavement. You would see them long before resolving the rebar. Surveyors today use similar techniques of piling rocks at points, but more typically use a lath stake with flagging attached to attract your attention. Of course wooden stakes fall over and flagging weathers, so rock piles really are more useful even if they cannot be seen from as far a distance as flagging. Now, why is it there? Who knows? You may be correct in your assumptions, but I find it unlikely that anyone is going to carry rebar into the desert (and a long way from anywhere) to build some kind of game field. Of course, there is no way to determine the age of this stuff, but keep in mind that in the pre-park days, people worked hard out there. Social activities were concentrated at/near residential areas, not way out in the desert. Perhaps Tom Alex has some information on this site, as it may be some NPS thing that has been long forgotten. My best guess (because that's all we can do) is that it is marking a study plot of some kind or an archeological feature, neither of which is immediately apparent. Since then I have realized that in the 1950's the river road started on the east side of the parking lot for the current location of the Castolon store. You can clearly see it marked on Google Earth, and the [locked] gate is a short walk from the current location of the restrooms. So Hartung's road, if it is not poetic license along with the rest of the story, would have been a northbound road somewhere in the vicinity of Castolon, not at the current location of the west end of the river road. Like Alan, I'm hoping that you have a chance to explore in the vicinity of Sam Nail. Last year I found the 'tiger trap' and the game camera but no sign of the stone hut. Flash, this is great trip report, love the pictures and all the detail.